Assuming you are an administrator to your hosted website you can add new users and give them permission to edit content on your site. First, you must log in to your site. The URL to log in is your site address followed by “/wp-admin”. For example, the School of Journalism and Mass Communication’s website login page can be found at https://journalism.wisc.edu/wp-admin and the login for J202 websites is at https://202.journalism.wisc.edu/wp-admin. First ensure you have your site selected by hovering your mouse cursor over My Sites in the WordPress menubar and clicking on your site. 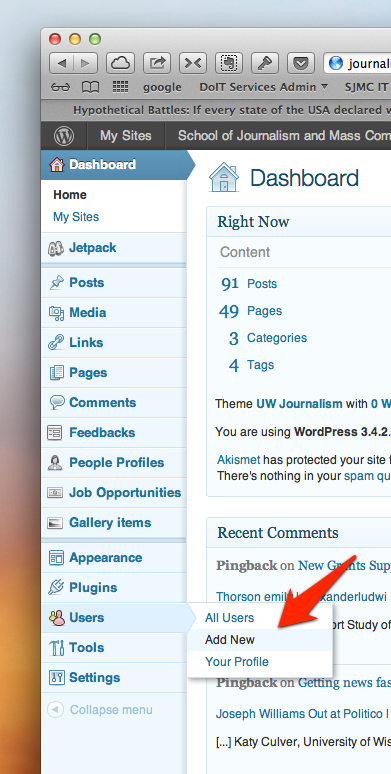 Next hover over Users in the left side menu and select Add New. If the user you are trying to add to your site is already in another SJMC website you can add them in the Add Existing User section. Start typing their NetID and WordPress will help you by autocompleting. If the user does not appear as an autocomplete option then they are likely not already in the system, user the Add New User option. When adding a new user their Username must be their UW NetID. Their E-Mail must be a valid UW email address, preferably netid@wisc.edu. 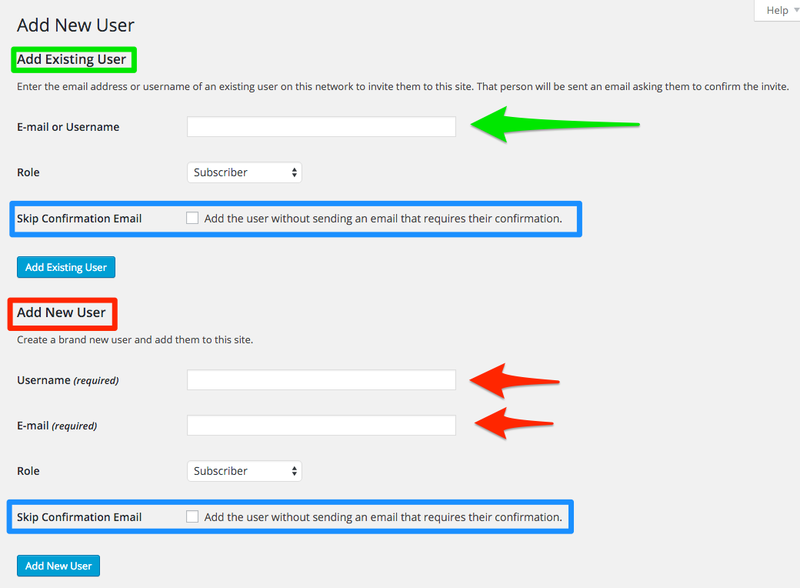 If you are a Super Admin in your WordPress installation then the Skip Confirmation Email option will be available. Checking that option is always a good idea as the auto generated login email will not actually help the user log in, since we are using the UW NetID login method. Finally, click Add Existing User, or Add New User and you are done. WordPress.org has exhaustive information on Roles here: http://codex.wordpress.org/Roles_and_Capabilities. Basic information on Roles is below. Super Admin – Full control over the entire WordPress installation. Capable of doing any action. Administrator – Control over the site they are administer of. This user can manage all users, content, plugins, and the look of the site. Editor – Is able to publish and manage all posts and pages on the site, both theirs and other users’. Author – An author may publish and manage only posts they have created. Contributor – Can write and manage their own posts but an Editor or higher must publish the posts. Subscriber – A subscriber can not do anything except manage their profile. This is the default user role.